No modern-day racer captures the romantic ideal of driving a racing car like GRID Autosport. I’m talking about the roar of the crowd and the squeal of big, fat, slick tyres over smooth asphalt. Lock-ups into hairpins as you dive down the inside of the leader on the last lap. The sensation of riding the knife-edge of grip and wrestling your car back from the brink of disaster as you fishtail over a kerb. Approaching a fast corner wheel-to-wheel with an unyielding opponent and wondering if either of you is actually going to give. Every little drama is reflected in the superb sensation of movement, making it feel like you’re in GRID Autosport, not just influencing it. The game is rooted in simulation, certainly, but you will spend significantly less time in the gravel than more straight-laced sims. The action is exaggerated too, with extremely fallible AI that not only makes believeable mistakes, but can experience a blowout at 160mph and end up flipping against a tyre wall, sending gravel and rubber flying into the air. This larger-than-life arcade excitement may be too chaotic for fans of ultra-serious sims (especially when there’s almost always a track-wide pile-up after the first corner), but everyone else will love the ‘highlights reel’ feel because, fundamentally, it is exciting to play. That excitement isn’t limited to witnessing and dodging incidents, as the AI drivers exhibit the finest track behaviour yet seen in a racing game, making extended battles feel like a showdown between two great rivals. Get into a close-fought race with one of these guys and you’ll witness defensive driving lines, late-braking overshoots into hairpins, and fiendishly clever cut-backs to instantly regain lost positions. As a result, a normally-disappointing 8th place finish can feel just as rewarding as a win, especially starting from the back with the assists switched off. Indeed, playing on the hardest setting is a blast, simply because it sets your ‘Flashback’ count to 0, meaning you can’t just undo errors Prince of Persia-style with a tap of Y, forcing you to consider your car’s damage levels as you drive. For maximum authenticity, you can even turn off the HUD and rely on aural feedback from your pit engineer by asking him about the condition of your car, or how you’re doing in the race via the d-pad. The PC version is magnificent and would easily pass as a PS4/Xbox One game (though sadly the game is not coming to those machines). The Xbox 360 version may not have a 60fps frame rate or 1080p resolution, but even so, it’s astonishingly close to the PC. With 3D spectators, real-time damage modelling, and 16 cars on-track, it’s a technical masterpiece. The PS3 version, however, is not quite as slick. It looks noticeably rougher, is more susceptible to frame drops and screen tearing, and the textures look comparatively muddy. Still impressive, but if you have the choice, get the PC or 360 version. 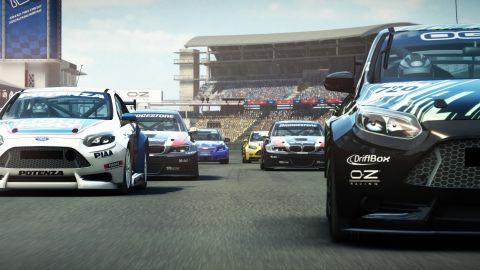 Many of the game’s triumphs come from the fact Autosport has been quite openly designed around feedback from the community over the good-but-disappointing GRID 2. Normally, I would argue it’s a very bad idea to listen to the more vocal sections of the internet when designing a game. But in the case of GRID Autosport, it has absolutely turned out to be the right thing to do. Let’s tick off the key improvements that this feedback demanded. Instead of having no cockpit cam, Autosport has two. Demolition Derby is now playable right from the beginning of the game, instead of tacked-on DLC. The drift-centric, simplified handling of GRID 2 has been replaced with responsive, nuanced control. The optional driving assists like traction control and anti-lock brakes are all back. The track list is a best-of compilation of GRID 1, 2 and real-world locations (and point-to-point tracks are all gone, to make this a more traditional racing game), while the career’s structure is much more focused on what you want to do. That last one’s made a huge difference to how extended sessions feel. The game’s front end has been massively simplified and split into five disciplines, the branches of which can be dipped into at your leisure for a season at a time. You could just play single-seaters forever (and I wouldn’t blame you--they’re wonderful), but if you do level up your XP evenly over all five categories, you unlock special, multi-discipline race series, so it is worth exploring all the avenues. Some seasons can feel a little too long if you do enjoy variety, but if longer play sessions are your game, you can multiply the lap count in the options. There’s a decent sense of rivalry with other drivers in the championships (curse you, Nathan McKane!) which gives even quickfire races more meaning when the name of your championship rival is superimposed over his car as it whizzes by. It’s not as integral to the experience as the likes of TOCA Race Driver 2’s excellent scripted narrative, and GRID 1’s constant aural feedback on where your opponent is currently running is still superior to Autosport’s, but the experience is richer for having clear rivals to beat. One of the sexiest road cars ever made is now yours to race and smash to smithereens. There’s that exquisite, fallible AI in action. No longer consigned to DLC status, Demolition Derby is playable from the Party Mode menu in the custom cup option right from the off. Both classic Minis and modern-day Mini models are available to race. Feel free to do Michael Caine impressions while you drive. The modern Touring Cars feel wonderful and offer some of the closest pack racing in the game, but you can’t beat some vintage TC action. The Arial Atom and the KTM X Bow R represent the Lightweight category. Both have ultra-responsive turning (and look beautiful). Insert obligatory ‘UP AND AT THEM’ quote here. As if the Atom wasn’t light enough! The Caparo T1s have exceptional acceleration and look like F1 cars with mudguards. Awesome. The Dodge Charger is the perfect choice for some street racing action, but is a lot of fun on dedicated circuits too, like Jarama here. The quintessential Gran Turismo car looks great in GRID Autosport, especially during night races like this. The Dallara Indycar represents ‘Formula A’ of the open-wheelers. It’s much more stable than the LOLA B05/52 ‘Formula B’ cars, which can oversteer if you shift up while accelerating out of a corner. This Mitsubishi Lancer is hot. Just look at it. And it’s drifting everywhere, leaving thick black rubber and plumes of smoke in its wake. Yum. What doesn’t work quite so well is the team-mate mechanic. The idea of telling your AI buddy to push forward or hold up others (via the shoulder buttons) is strong, but the reality is that they always seem to be struggling, and they’re not much use at the back of the pack. Another element that could be amazing--if just fleshed out a little more--is the in-environment commentary that can be heard when you pass a crowded spectator stand. It mentions individual incidents on the track, which is fun to listen out for, but it’s usually the same few soundbites, which sadly breaks the spell. Similarly, the pit audio repeats itself far too quickly and doesn’t always make perfect sense. One particularly enjoyable new feature is tyre wear, which is only enabled during Endurance races. Wheelspin, running wide, and sliding all damage your tyres, forcing you to drive neatly and constantly weigh up whether you can afford to push a little harder. It becomes so integral to the driving process, you’ll find yourself looking for the percentage indicators in other modes every time you hear the wheels slip. Perhaps it would be one too many things to consider if it was implemented game-wide, but it works very well and really adds to the tactical element of the Endurance branch of the career. For all the positive steps forward, we’re not quite looking at the ‘perfect racing game’. There are still elements of the original GRID that are superior, such as its hazy art style, or the sense of having someone really guide you through an actual racing career. But the simple fact is that GRID Autosport looks better than the original, handles better and gives you greater control over what you play and when you play it. It’s a tightly delivered, yet content-packed, experience that will serve as the real GRID 2 while we wait to see what the EGO engine will look like on Xbox One and PS4. Description Competitive Formula One racing + cars that drift like no other = The third addition to the Grid Franchise Autosport.